Sometimes it feels like the majority of people who read blogs also maintain a blog of their own. Perhaps this is because people who write blogs are also more likely to comment on other people’s blogs. I know sometimes I’ll leave a comment on a blog just to let the author know someone is reading their stuff even if I don’t have much to say. With that in mind I’d like to drop a little advice on blogging from time to time. I’ve recently gone through a bunch of whole-sale changes to my blog, from deleting all the old content (yes, intentionally) to trying to change to a magazine format. Somehow abandoning the magazine format and choosing to focus more on my hobby without trying to update the blog every time I paint for 5 seconds has resulted in an increase of both painting and posting. The results of which is currently queued for posting in the coming week. In fact, I’ll be on vacation and no-one will even notice. Well, no one will notice because this blog doesn’t exactly have a reputation for consistent updates. However, if I did have such a reputation, no one would notice because I have queued posts right up until Friday with more in drafts or waiting to be written. 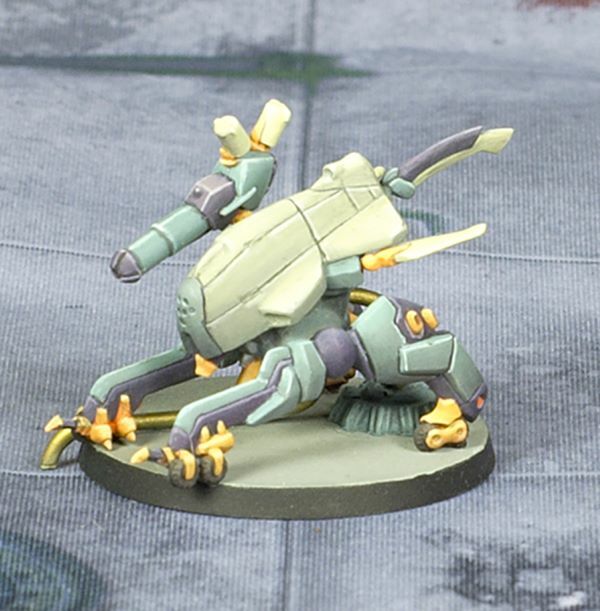 Here’s a random image of an Infinity Nomad Zond Remote I painted because I hate blog posts without images. This seems like a good time to look back at what has changed for me recently. Generally I don’t like naval-gazing in blogs so I’ll try to beat back the “emo” tendencies of introspection. I found a good line between social media and blogging. I’m focusing on my hobby, which drives the blog, instead of having the blog try to drive the hobby. I’m making sure that my blog appeals to me. I think the last two are pretty self-explanatory. Leave me a comment if you want clarification. It is the first which needs some explanation. I have long struggled with what to actually do with Twitter and Google+. Google+ I thought I had a handle on. At least I was getting new followers a couple of times a week even when I wasn’t posting. Twitter, on the other hand, was just a blur of tweets I wasn’t following and a vague sense that I should be tweeting without knowing what I should be tweeting. I wanted to find the role social media would play in my blog with the feeling that I didn’t like the time it took to constantly create WIP posts for my projects nor the end results. I found I was able to take a quick cell-phone pictures of my WIPs and share it on Google+ and Twitter let me share what I was working on in a casual way commensurate with its worth. This was the epiphany that I was looking for. Now I could share my WIPs in less time, giving me more time for painting and blogging. I also realized that my problem with Twitter was that I wasn’t getting involved in the conversation. I’ll leave that thought for another day. Will these changes last and what effect will they have on my blog? Only time will tell. Most importantly I am enjoying blogging and enjoying my hobby and that alone is worthwhile, regardless of whether I get more subscribers or follows. Of course, every blogger wants you to Subscribe or follow on Twitter and Google+. It doesn’t take much but makes them feel all warm and fuzzy. Me too. Subscribe, tweet me, plus (?) me. Next story Need More Deadzone Terrain Connectors?